Design easy to understand content; people looking at the page should find all the answers they need. I was in charge of both the user experience of the page and coding in the WordPress website. The project needed to be delivered within two weeks or 10 days of work. Starting with sentence 2: I decided, together with my colleague Allie, to use the first five days to design the page. This included talking to the sales department about the product definition, benchmarking the different options, white boarding the first drafts, and ultimately doing the UX and UI using Sketch. The second week was used to finalize the marketing content, code the page, and push it to production. First, from a product perspective we needed to work with the sales team in order to simplify the pricing, or at least decide which part of the pricing we should display. In fact, the pricing sheet used by sales was an Excel file with multiple tabs and was very hard to understand. The design of the page should be flexible to add the online purchase afterwards. Another question was where to place the pricing link on our website. Should it be highlighted or hidden? 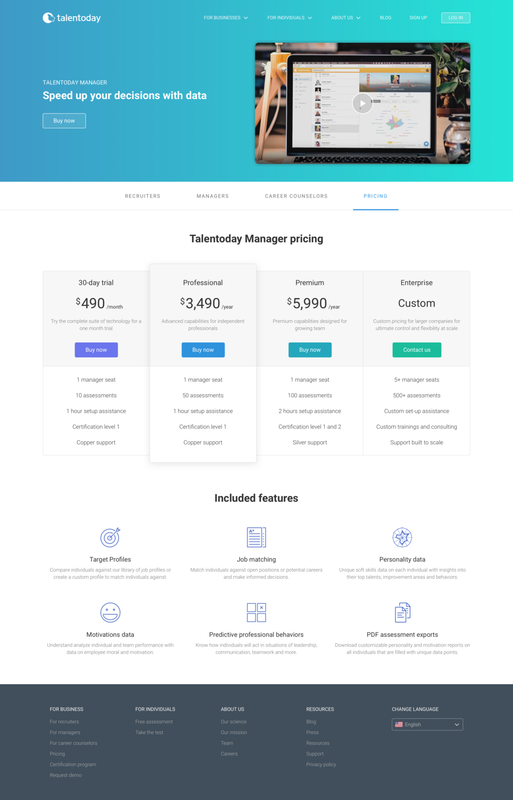 This web page was designed for professional users who were interested in the Talentoday Manager solution. This project was mainly the result of the collaboration between five people. I managed the UX design and front-end development. Allie was in charge of the marketing. Peter and Claire-Marie were the sales managers for the Americas and Europe, respectively. And finally Eric, the USA general manager, was responsible for approving the drafts and the final design. As mentioned previously the first work which had to be done was to simplify the pricing or at least decide of the elements to display. For this particular project benchmarking was really important. Indeed the pricing page is the kind of web page where we were not looking for originality. Instead we wanted to make sure to design a page that people would understand really fast. Header and navigation: It will be the same as the other "Talentoday Manager". FAQ: Answers to the questions that people ask the most when they contact us on Intercom to know more about our pricing. Tagline and call-to-action for the free trial at the bottom of the page. For the pricing table multiple layouts have been considered. We picked the layout "Alpha" because it was the team's favorite but the other layouts were valid as well. It was decided to only work on the pricing table for the first release. Other sections like FAQ or the customer logos and quotes would arrive later. It is interesting to note that prior to this project, about 2 years before, a pricing page already existed on the website. Even if the pricing changed a lot few elements were kept such as some colors. 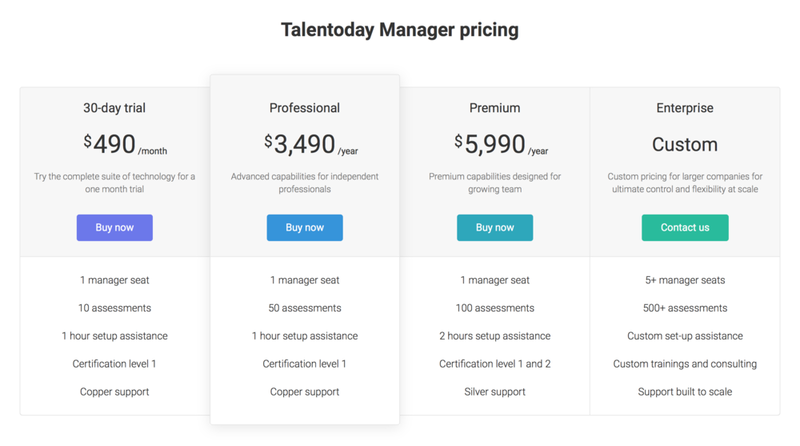 In 2015 the first public pricing of the Talentoday Manager is released. People are able to purchase a Talentoday subscription directly from the website, using Stripe. 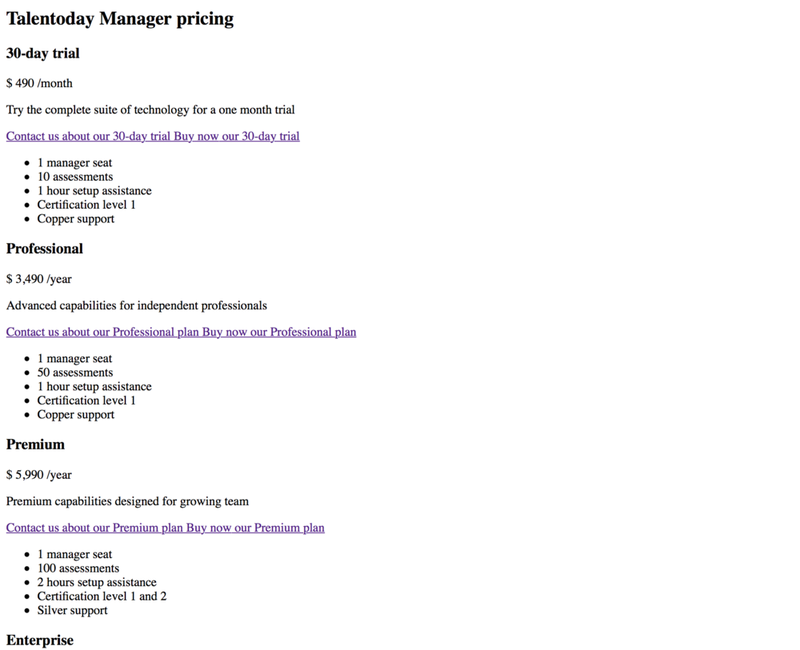 Few months after the initial page, the page is simplified and use the same header as the Talentoday Manager page. In the proposition the saving using an annual billing is displayed under the price. In the proposition the user can easily switch between monthly and annual billing cycle. This proposition doesn't contain the "Custom" plan and display the features which are not present in a plan by crossing out them. Using both the benchmarking and the previous ideas we decided to go with the layout "beta". At this moment the pricing sheet moves isn't finalized and some points like which features to include or what is the main plan are still being discussed. Putting the previous mockup on InVision helped the sales having a better vision of what they want. It is decided to display the "Custom" plan. Multiple layouts are being white boarding (with the custom plan being by itself after the Stripe plans for example) but we decided to just another column. We switch at the same time from the layout "beta" to the layout "alpha" which is offer more space on tablet. The "Professional" plan is being promoted by the sales. To highlight it among the other plans I use a shadow. Custom column is replaced by just a sentence following the Sales decision. It doesn't looks really good but it is design to be temporary. Since all the features are now included in the plans I decided to move them out of the pricing table. It eases the reading of the page by having the pricing table displaying only the difference between the plans. After some InVision feedback from the marketing the final page is approved by the team and ready to be coded. Making sure that the page is fully responsible and accessible on any size of device from mobile to desktop. Coding the website using clear and logic HTML markup. For example by using ‘ul’ lists instead of ‘table’ when it makes more sense. We were able to deliver an easy to read page which was fast to implement on the website. My colleague Allie and I took less than the 10 days of work initially planned, but the project was released one week late. It was due to the fact that the time to simplify the sales pricing sheet was underestimated. (This was a result of underestimating the time needed to simplify the sales pricing sheet). If we had to redo a similar project, we would ask for the sales team to simplify the pricing sheet ahead of the UX design. However, we were able to solve this timing issue and meet the assigned deadline by working on other pages on the business website while we waited for feedback on the pricing sheet.